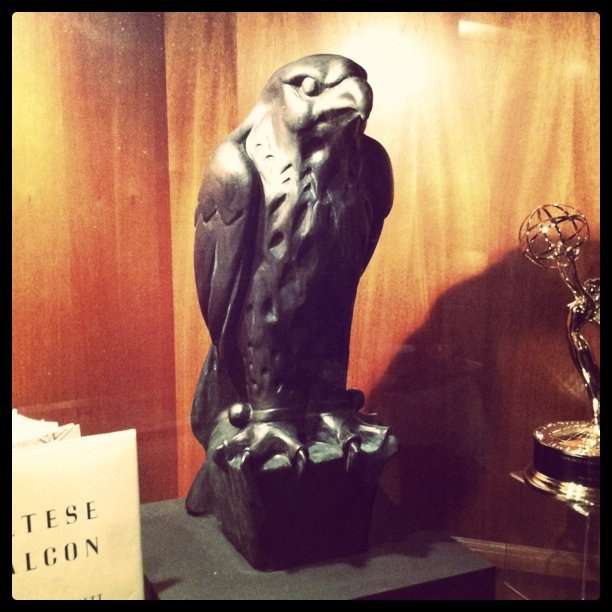 The Maltese Falcon statue that had been displayed at John's Grill. It was stolen in 2007 and remains missing. 2006 photo by Eddie Codel. 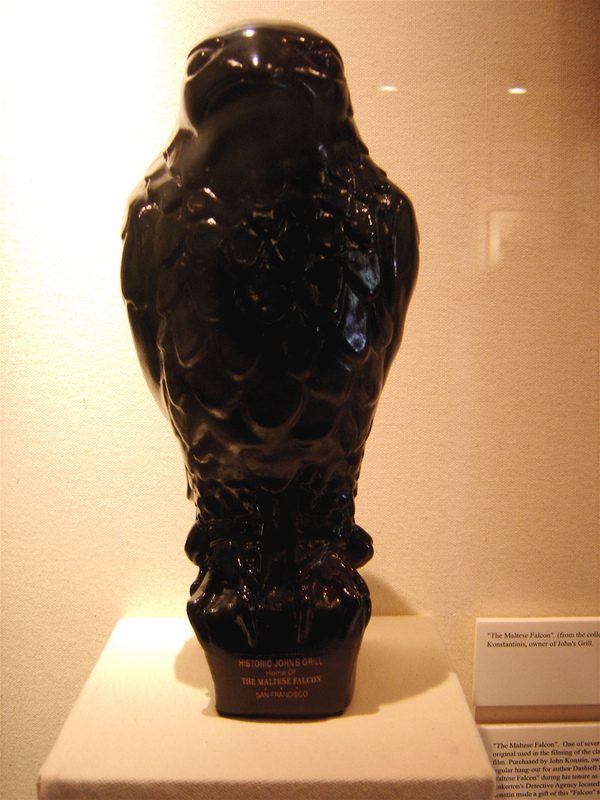 In Dashiell Hammett’s 1930 noir thriller The Maltese Falcon, private detective Sam Spade encounters an international gang of thieves who have come to San Francisco on the trail of a stolen statue – “a glorious golden falcon encrusted from head to foot with the finest jewels… painted or enameled over to look like nothing more than a fairly interesting black statuette.” Hammett describes the disguised treasure as a “foot-high figure of a bird, black as coal and shiny where its polish was not dulled by wood-dust and fragments of excelsior.” The plot also involves a fake of the disguised statue – a black enameled copy made to resemble the original. Since its initial publication, the novel has been adapted for both stage and screen. Perhaps the most famous adaptation has been John Huston’s 1941 film starring Humphrey Bogart as Sam Spade. John's Grill, at 63 Ellis Street. 2006 photo by Mark Coggins. 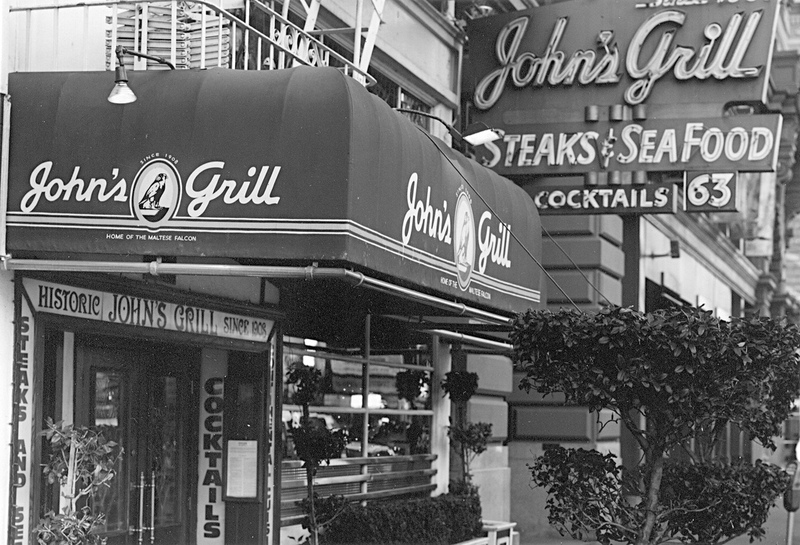 According to Steve Rubenstein and John Koopman of the San Francisco Chronicle, John Konstin, the owner of John’s Grill, sought to purchase one of the statue props from the 1941 film for display in his restaurant. Konstin’s restaurant is mentioned in The Maltese Falcon, and he has used that connection to promote his business. Although he was unable to acquire the movie prop, he did receive a plaster copy that Warner Bros. had created for publicity purposes. The plaster cast came to Konstin from Elisha Cook, Jr. – a San Francisco actor who played gunsel Wilmer Cook in the film. This statue was a copy (the plaster cast) of a copy (the prop from the film) of a copy (the fake statue). Konstin prominently displayed the statue in his restaurant until 2007, when – like the statue in the novel and film – it was stolen. To replace it, Konstin commissioned Academy of Art professor Peter Schiffrin to create a new bronze version of the statue – a copy of a copy of a copy of a copy. The replacement falcon, created by Schiffrin and his students and now on display at John's Grill. 2011 photo by Eddie Codel. That statue at John’s Grill is not the only Maltese falcon to be found in San Francisco. In fact, there are multiple statues. Whereas a group of crows is a called a “murder,” and a group of larks is an “exaltation,” a group of falcons is a “cast.” The term is particularly apt when describing the falcon statues in San Francisco insofar as the term reminds one of a cast of a statue, which serves as a copy; or a cast of actors, whose job it is to impersonate. In addition to the statue at John’s Grill, another statue has been in Dashiell Hammett’s former apartment at 891 Post Street #401. Hammett lived there while writing The Maltese Falcon in the 1920s, and some literary critics also identify it as Sam Spade’s apartment in the novel. Former occupant Bill Arney, who is affiliated with the Film Noir Foundation, redesigned the apartment as an homage to Hammett – including a statue of the falcon. 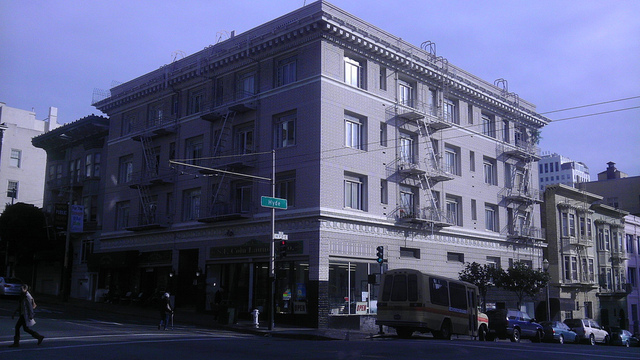 Writer Robert Mailer Anderson has since taken over the apartment and taken additional steps to restore it to the way it appeared when Hammett lived there. The apartment’s interior is now featured on the poster for this year’s Noir City film festival. 891 Post Street. Apartment #401 is on the top floor, on the corner at the intersection. 2012 photo by Drew Bourn. Another of the statues is on display in the lobby of the Flood Building at 870 Market Street. Hammett had worked in that building as a private detective for the Pinkerton Detective Agency. Another statue is displayed behind the bar at the Tosca Café in North Beach. Owner Jeanette Etheridge has recounted that she discovered the statue at the bar when she bought it decades ago, and that its origins are a mystery. Another statue is located in the Dashiell Hammett Suite at the Hotel Union Square. 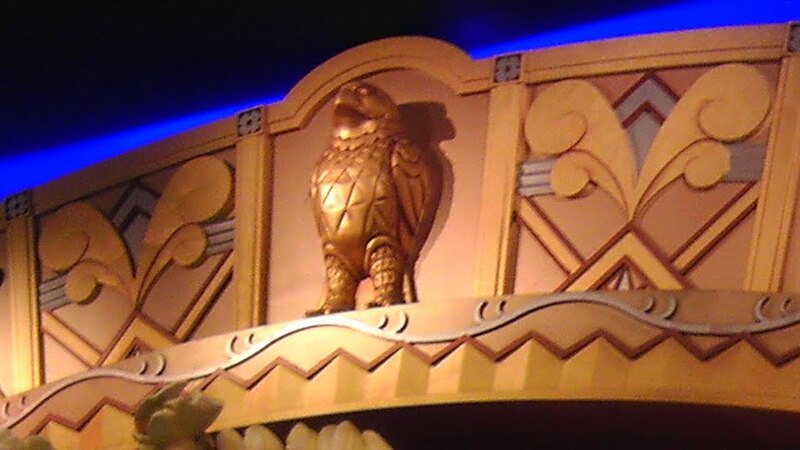 Yet another Maltese falcon appears in the artwork above the consession area at the Metreon movie theater. Don Herron, who has been leading a Dashiell Hammett walking tour since 1977, has shared with me his understanding that a Maltese falcon statue once stood in what is now the Nordstrom department store at 895 Market Street, the former site of Samuels Jewelers where Hammett had once worked; and that he has seen statues of the Maltese Falcon displayed in the offices of local detective agencies. Above the concession stand at the Metreon movie theater. 2011 photo by Drew Bourn. I’ve created a Google Map to indicate the location of these Maltese falcon statues. If you are aware of additional statues, please feel free to let me know – I’d be glad to include them on the map. If you decide to go hunting for the statues, it might interest you that Market Street Railway Museum has described the 1920s public transportation that the characters from The Maltese Falcon would have used to move among some of these locations. The fact that there are now so many Maltese falcon statues located throughout San Francisco is interesting for at least two reasons. First, it is ironic insofar as the plot of Hammett’s novel revolved around the difficulty that the characters encountered in trying to locate the statue – a difficulty that was compounded by the existence of a copy. Secondly, the existence of so many statues recalls the work of Jewish German philosopher Walter Benjamin. In his 1936 essay, The Work of Art in the Age of Mechanical Reproduction, Benjamin contrasts photography and film with other forms of art. Whereas painting or drawing involves creating an original from which copies can be made, film and photography have no originals. Each print that is struck from a negative is identical to every other print; each is a copy, but no “original” positive print of the film or photograph exists. For movies like John Huston’s “The Maltese Falcon,” endless new prints can be struck from the film negative, but there is no “original” film positive in the same way that there can be an original painting. Similarly, the reproductions of the Maltese falcon statue can be seen as copies for which there is no original. Hammett’s 1930 novel is a work of fiction – it does not recount a real episode of San Francisco history, and there was never an actual Maltese falcon statue. Yet despite the absence of any original statue, copies nevertheless proliferate in San Francisco today just as multiple prints of Huston’s film exist. For those who are interested in further background on the statue, two publications may be of interest: Don Herron’s Dashiell Hammett Tour Guidebook and Richard Layman’s Discovering the Maltese Falcon and Sam Spade. For film enthusiasts, the Tenth Annual Noir City film festival will be featuring a special Dashiell Hammett program on Sunday, January 29 at the Castro Theatre. The screenings will include both Roy Del Ruth’s 1931 version of “The Maltese Falcon,” as well as John Huston’s 1941 version. In Alfred Hitchcock’s 1958 San Francisco noir thriller, Vertigo, retired police detective Scottie Ferguson (Jimmy Stewart) investigates Madeleine Elster (Kim Novak) – a woman with a mysterious connection to San Francisco’s past. A twist of the plot results in Scottie himself becoming obsessed with the past, and the story moves forward by exploring the risks involved in investigating – and re-creating – history. 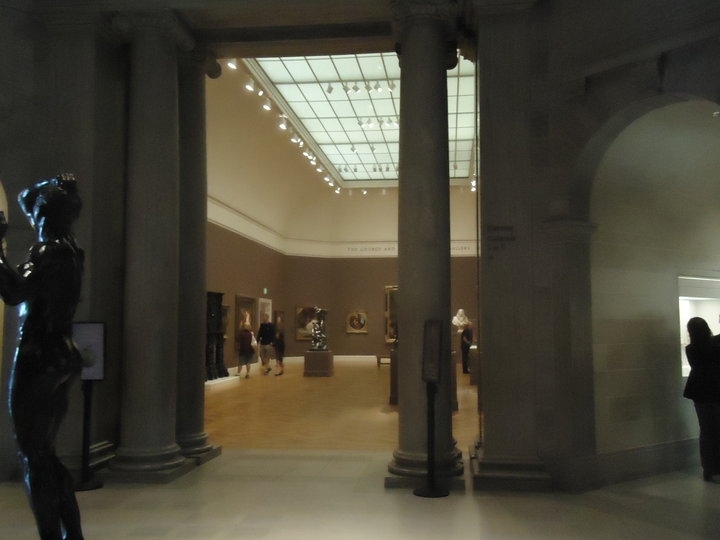 During the course of Scottie’s investigations, he trails Madeleine to locations around the city, including the Mission Dolores cemetery, the George and Marie Hecksher Gallery in the Palace of the Legion of Honor, and the Henry J. Fortmann Mansion that used to stand on the northwest corner of Eddy and Gough Streets. By following Madeleine, Alfred Hitchcock and his Director of Photography, Robert Burks, were able to include a considerable number of on-location shoots. That was still somewhat novel for the Hollywood studios; shooting almost entirely on set had been the norm for 1940s San Francisco film noir such as John Huston’s The Maltese Falcon. I regularly visit and take pictures of locations that had been shot for Vertigo. I’m not surprised by Novak’s claim that others visit these locations, as well. Some, such as Hank Donat, CitySleuth of ReelSF, and the web team at Worldwide Guide to Movie Locations, have posted their photographs on their websites. Perhaps among the most ambitious of those visiting and photographing sites from Vertigo have been Jeff Kraft and Aaron Leventhal, who have featured their work in their 2002 publication, Footsteps in the Fog: Alfred Hitchock’s San Francisco. The website of their publisher, Santa Monica Press, includes some images and content from their work. One recent example of Vertigo’s continued reach into the present came when the Lembi Group hired Los Angeles-based Thomas Schoos Design, Inc. to renovate 940 Sutter Street (which appeared as the Empire Hotel in Vertigo), re-opening the property in 2009 as the Hotel Vertigo. The new hotel even featured suites named The Gavin, The Scottie, The Carlotta, The Midge and The Madeleine, after characters in the film. As Sarah Duxbury reported in a May 21, 2010 article in The San Francisco Business Times, however, the Hotel Vertigo has since been foreclosed, and was purchased in an auction by the Centerline Capital Group. The Hotel Vertigo may become a part of San Francisco’s past. Even if that were to happen, however, it may live on as one of many sites to which Vertigo enthusiasts return again and again – including, perhaps, an incognito Kim Novak.